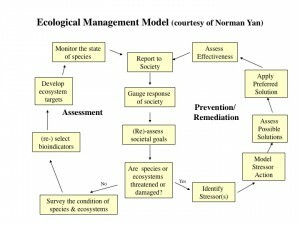 Adaptive management is a term coined by Holling (1978) to describe a process for moving forward on some kind of natural resource management issue, e.g. fisheries, where the best form of action isn't totally clear. 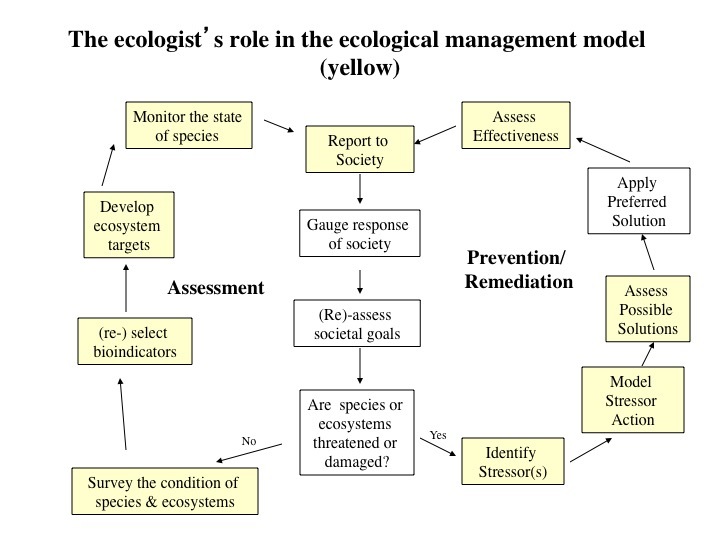 The basic idea is to do an experiment, where one of the treatments is a particular proposed management action for the ecosystem, then to track the response, and then, to adjust management according to the results: hence, adaptive management. It's such a simple idea, yet, in practice is so difficult to implement in a multiple stakeholder, non-academic, real-life setting. 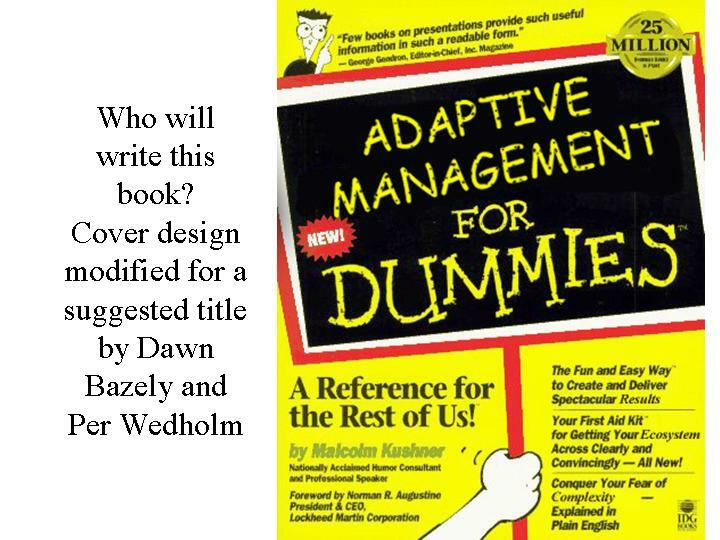 The proposed Adaptive Management for Dummies image, above, was my first foray into Adobe Photoshop back in 2002. It illustrates how I felt at the time, about getting my research, on the impacts of deer herbivory on Carolinian forest dynamics in southern Ontario, translated into management action. 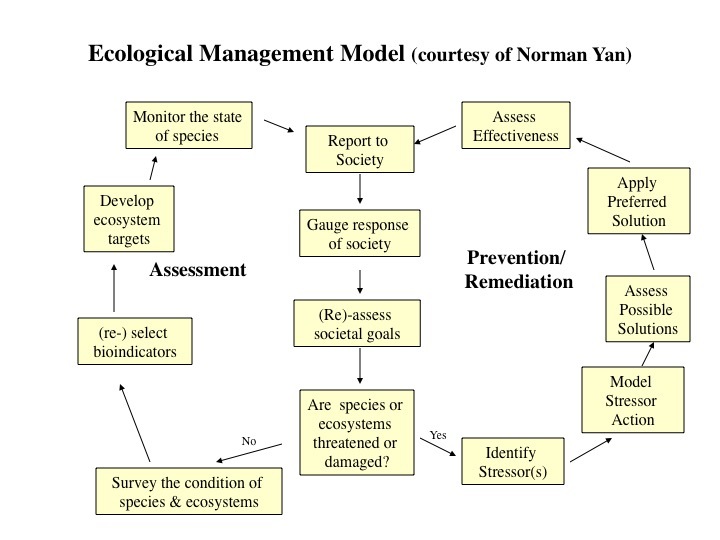 I explain adaptive management in my Applied Plant Ecology course using the great flow-chart (left) for Ecological Management by retired YorkU Biology prof. and Ontario Ministry of the Environment senior scientist, Dr. Norm Yan. I liked this model so much, that we included it in Myers and Bazely (2003). Norm compares ecosystem management to personal health care. The yellow boxes in the figure below are those that specifically concern environmental scientists, while the white boxes are those that concern broader society, beyond scientists, and will involve debates about values and policy. This past July, I found myself applying the concept in reverse, to my own health and my April back injury. It was very empowering for me. I had an "aha" moment in mid-July when I realized that what all of the medical professionals treating my hip injury had been doing, was a form of adaptive management. By mid-July, over 10 weeks after what everyone thought was a repetitive strain injury, I had become very mobile, as in, was able to walk 10,000 steps daily. In late April I had been pretty much immobile and in 11/10 pain level agony. This agony lasted through to mid-May, but declined substantially with chiropractic treatments and acupuncture. Thereafter, I started physio and RMT. But, I had hit a wall in early July: I still couldn't stand or sit, for longer than about 10 minutes without getting a huge pain along the top of my thigh. I was lying on my back a lot, often for 5 hours a day, in between bouts of activity: standing, moving, driving and, occasionally sitting . From late-May onwards, I had been diligently doing all of my physiotherapist-prescribed daily exercises and from June, I started working with a personal trainer to "strengthen my core". Ergo, I really should have been a lot better, with less back pain and an improved ability to sit down. My second "aha" moment was realizing that no one on my great medical team was really behaving like a scientist, when it came to figuring out what had actually happened to me to cause this ongoing pain. There had been little, if any, serious discussion about the ultimate cause of my injury, as opposed to its proximate or immediate cause. Also, it was becoming very clear that this injury was probably going to prevent me from travelling to my lab at York University in the Fall. I experimented with, and found that 1.5 hours standing each way on the TTC to YorkU, was simply not a viable option for doing a productive day's work. Perhaps, I should have had the "look, I'm a scientist" conversation that eventually took place with my doctor in mid-July, sooner. After all, by then, I had cancelled my planned summer field work and hadn't made it to conferences for which I had paid, and also to board and student meetings. I was still a de facto invalid, unable to drive or even sit in a vehicle without great effort and discomfort. If I wasn't a professor with work flexibility and a great benefits plan, it would have been difficult to remain employed in a regular 9-5 job while spending 25-50% of each working week seeing medical people (physiotherapists, etc). Luckily, I was able to keep up my minimum, basic work, from home for a few hours each day with a standing desk and by doing lots of skype meetings. But, what was alarming, was that the slowness of the recovery wasn't surprising to the people treating me. And also, to them, it appeared that I was making substantial progress in recovering mobility. Back injuries, they all said, were slow to heal. No wonder back pain is a major cause of loss of work time. How many people, I have wondered, lose their jobs because of it? Back to me: one day in mid-July, I had enough. "I'm a scientist", I thought. "We should be asking whether the general assumption: that my back injury was a repetitive strain injury, due to sacro-iliac joint or muscle damage caused by too much twisting and stooping in the greenhouse and way too much driving in Toronto and southwestern Ontario's heavy, often gridlocked traffic, was, in fact, correct." I STILL COULDN'T SIT DOWN FOR MORE THAN 10 minutes! (I still can't). (That's our lower back and hip at right: I learned all those boring muscle names over the summer. 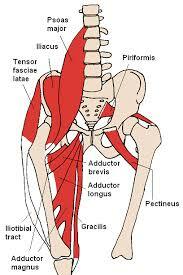 Anterior Hip Muscles 2.PNG from Wikipedia). So, back to my doctor after 10 weeks and I said "we need more data about my condition and to re-think things" (as per the management figure above). I explained that although, originally, I didn't have the tingling and loss of feeling that would have suggested nerve damage on the day after my injury in late April, that this tingling and loss of feeling had happened in abundance, 4 days later. However, much of it eventually disappeared with various acupuncture and chiropractic treatments during May and into June. My family doctor didn't know this, because she had said "come back in 6 weeks, if you don't see an improvement", so I didn't go back, because I had seen an improvement (again, these long periods in between having conversations of this sort - ok, I get that bodies take time to heal... but, as my Twitter bio says, I'm impatient). On returning to my family doctor after 10 weeks, she said "your front-of thigh pain, which you're only now telling me about, suggests a lower back issue. I'm sending you to ISEAC." ISAEC, the OHIP funded Inter-professional spine assessment and education clinics project, was where I spent the longest time discussing my injury with any one expert: an hour meeting and a 10 page survey. He concluded that, yes, I also had a lower back injury, but all the focus had been on my SI joint. What he actually said was "you have symptoms of more than one injury". It took 3 months to get to this. When I asked: "Could I possibly have been hurt and not have known about it when I was rear-ended last November but didn't seem to be injured ? ", the ISAEC physiotherapist, my other physiotherapist, my RMT, my chiropractor and my personal trainer, not to mention the very nice lady that sticks needles into me, all agreed: "Yes, that's very likely. Your body would have absorbed the shock through your left leg, which was fully engaged and tensed with the clutch in". At this point, we're talking about a 5 month delayed response! Last November 2014, I had tweeted about not being affected by the collision. I was truly shocked that the effects might manifest themselves (in conjunction with lots of RSI) 5 months later. Talk about a delayed response. I have, since, heard from lots of other people that this kind of thing is quite common. So, it's all about teasing apart short-term and long-term effects and recognizing proximate and ultimate drivers. This is what ecology theory deals with: how ecosystems change over time, in response to diverse interactions and drivers. My 3rd "aha" moment happened, when I realized that what I was dealing with, is the notoriously complex (and evil, when it gets injured) Lower Back & Pelvic Ecosystem (seen above in a diagram from "Blausen gallery 2014". Wikiversity Journal of Medicine. DOI:10.15347/wjm/2014.010. ISSN 20018762. - Own work). @jwoodgett @tehpet @logandonaldson @AuroraBirdialis No airbags deployed in either car. The mini didn't budge. I HEARD the collision! With this new discussion in mind, my RMT ascertained that some of the big-muscle exercises that I had been diligently doing everyday, were, most likely re-injuring the small muscles on either side of the vertebra of my lower back. Hence, the ongoing back pain, which was happening, because although my big muscles had recovered in the few weeks after my April injury, the little muscles had not. 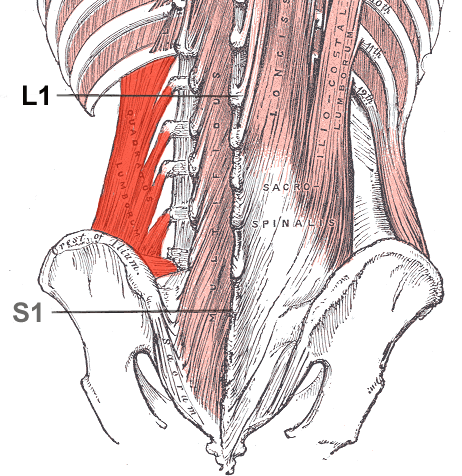 (Quadratuslumborum.png from Wikipedia, at right). My RMT also encouraged me to get some more data about my pain and condition from an independent source, other than me. Up to July, I hadn't had an x-ray or MRI, because everyone thought this was a non-traumatic, muscle-based repetitive strain injury. So, later in July I bullied my doctor's locum into doing a (cheap) x-ray. This was great because I was happy to find that there was no bone damage evident. 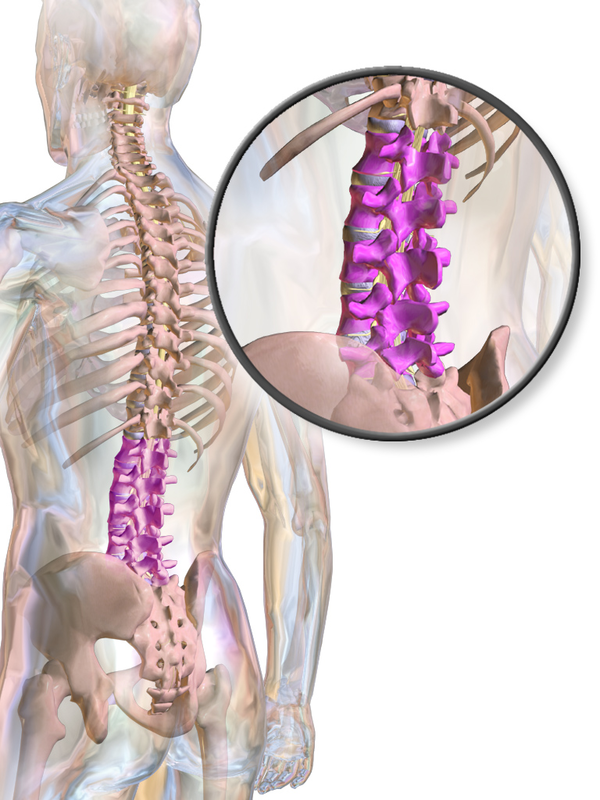 So, now my new mantra is: "stability and strength are not the same thing", as I do my very technical Pilates exercises with a 3rd physiotherapist, who specializes in this, to fix those little back muscles. When I met with her, recently, she said, as did everyone else, "back pain is difficult to diagnose". Yep, I know that now, but, in fact, it's not surprising: it's a complex ecosystem of bones and muscles (Homo sapiens walking upright is an evolutionarily crazy thing, that may have evolved in response to drought). I'm very happy that after a summer of getting very little of my planned academic work done, that I can finally see a light at the end of what is now a 4 month tunnel. I'm also glad that I was able to do take an adaptive management approach together with my medical team. I would tell each of them what the other was saying, but this isn't usually the case, from what I understand, because often, injured people don't go to all the medical professions at once, like I did. In my opinion, it would have been helpful, if some of these excellent people could have talked to each other directly, without me as the conduit. I would recommend that anyone seeing multiple medical practitioners ensures that they speak, because they're all seeing a different piece of the lumbar-pelvic puzzle. When my new physiotherapist asked me if I had ever done Pilates, I said, "yes, it's much harder than it looks, and it's not really my thing." ps 3 days later, I was in agony from 10 minutes of barely-moving-anything exercises. But, I'm gonna keep the faith, knowing that we're doing adaptive management together. pps May 2016: I still do pilates every day. This is the only way to avoid re-injuring my left hip and back muscles. I even do exercises on one of those awful looking pilates reformer machines. I have discovered that doing pilates for back injury recovery is quite different from the way that people do pilates exercises in general exercise classes. I spent 2 months simply learning how to breathe and "engage my core". I learned that stability and strength are 2 different things. I was always strong, but I must confess that I have the best posture I have ever had and I can stand on one leg without wobbling -- I never could do this properly.